Doug is an experienced professional who has built a career and reputation based on serving clients. After a successful career in the National Football League, Doug shifted his career to strategic wealth management. Since 1989, Doug and his team of experts have been helping thousands of people find their path to financial security. A proud graduate of the University of Texas, Doug played offensive line for the Longhorn football team for four seasons. He was named a consensus All-American for both football and academics his senior year. He was a second-round draft pick in 1984 of the St. Louis Cardinals and went on to play for eight seasons in the NFL. Over his career he played for the Cardinals, Houston Oilers and the Cleveland Browns. When a football injury temporarily sidelined his career, Doug Dawson joined Northwestern Mutual. He realized the opportunity for impact associated with the career, because of the legacy of his grandfather, Ross Dawson, who was a General Agent and member of the Million Dollar Round Table. When Doug returned to football to play for the Oilers, he continued to meet with clients. In fact, his last two years of professional football were his first two years of finishing among the top twenty performers in the nation with Northwestern Mutual. After the NFL, Doug focused full time on helping others find financial security. He has built a strong wealth management team and continues to achieve Northwestern Mutual's highest honors. The Chartered Life Underwriter (CLU®) designation has long been recognized as the fundamental and foremost educational credential for life insurance professionals. The Chartered Financial Consultant (ChFC®) designation focuses on the comprehensive financial planning process as an organized way to collect and analyze information on a client's total financial situation; to identify and establish specific financial goals; and to formulate, implement, and monitor a comprehensive plan to achieve those goals. Doug Dawson is a qualifying/life member of the Million Dollar Round Table. Doug and his team encourage you to review the background of every financial professional you may work with at www.finra.org. The Financial Industry Regulatory Authority (FINRA), is the largest non-governmental regulator for all securities firms doing business in the United States. All told, FINRA oversees nearly 5,000 brokerage firms, about 173,000 branch offices and approximately 677,000 registered securities representatives. The report summary provides an overview of the broker's professional background and conduct. Please press the "view full PDF report" button. After achieving the high honors in both football and academics, Doug graduated from the University of Texas at Austin in 1984 with his Bachelor's degree in Petroleum Engineering. 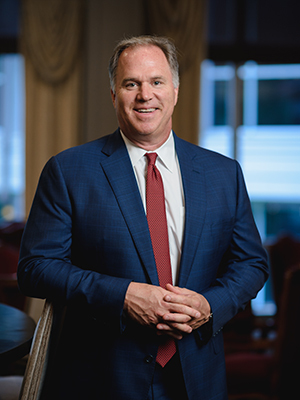 After college, Doug played professional football for the Cardinals, Oilers and Browns during which time he also started his practice with Northwestern Mutual, placing among the top twenty performers in the nation. These achievements would be a dream come true for some people, but, for Doug Dawson, they were a platform to make other people's dreams come true. Doug found that the most fulfilling experiences have been off the football field. Doug Dawson's passion for making an impact and turning dreams into reality began during his football career. While volunteering for Make a Wish, Doug visited children with life-threatening illnesses and established relationships with the entire family. Over the years, Doug has continued to serve on the Make a Wish Board, as well as other local non-profits like Fellowship of Christian Athletes. Above all, Doug considers being a Dad his greatest opportunity for impact. According to Doug, "Arlin and Ross are a true blessing. I thank God every day for the privilege of being their father." Whether serving the community, spending time with his kids, or meeting with clients, Doug Dawson considers every moment an opportunity for impact. Doug serves as a coach and accountability partner to his clients along with his team of highly-credentialed associates who share his vision for making an impact. Together, Doug and his team inspire others to dream big dreams, impact the community with their hearts for service and turn financial security into a reality. Douglas Arlin Dawson uses Dawson Financial Services as a marketing name for doing business as representatives of Northwestern Mutual. Dawson Financial Services is not a registered investment adviser, broker-dealer, insurance agency or federal savings bank. Northwestern Mutual is the marketing name for The Northwestern Mutual Life Insurance Company, Milwaukee, WI (NM) (life and disability insurance, annuities, and life insurance with long-term care benefits) and its subsidiaries. Douglas Arlin Dawson is a Representative of Northwestern Mutual Wealth Management Company® (NMWMC), Milwaukee, WI (fiduciary and fee-based financial planning services), a subsidiary of NM and federal savings bank. All NMWMC products and services are offered only by properly credentialed Representatives who operate from agency offices of NMWMC. Representative is an Insurance Agent of NM, and Northwestern Long Term Care Insurance Company, Milwaukee, WI (long-term care insurance) a subsidiary of NM, and a Registered Representative of Northwestern Mutual Investment Services, LLC (NMIS) (securities), a subsidiary of NM, broker-dealer, registered investment adviser and member FINRA (www.finra.org) and SIPC (www.sipc.org). Douglas Arlin Dawson is primarily licensed in Texas and may be licensed in other states.